The SuperGamer-1 is a modification of the famous and well respected PCLinuxOS distribution optimized for gaming. I will make this review brief. .It includes 3d acceleration drivers, the underlying PCLinuxOS system, and several nice game demos. .The Supergamer-1 dvd performed very well. I had no stability issues, even though I was running off the DVD only. .The net connection and graphics automatically enabled. .Sound was not automatically enabled. In fact it used the wrong driver for my AC97 codec on board sound. .Nexuis was not playable on line because SuperGamer-1 came with an outdated version. .Could not handle many of my favorite Internet-media file types including QuickTime and Windows Media out of the box. In conclusion PCLinuxOS P.92 is great. SuperGamer-1(PCLinuxOS P93 DVD Game Edition) is not. For the record, PCLinuxOS P.92 can handle many of your favorite Internet, office and media file types including Windows Media, Flash, Java, Real, .doc, .xls, .ppt, .mp3, .pdf, .mpg... well you get the picture. PCLinuxOS uses the Synaptic/apt system of package management that is so fall-out-of-bed easy, a cave man can use it. 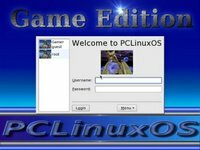 Run Windows programs inside Linux?